You should be able to complete all this in about 15 minutes. By the end of this tutorial you will have a basic understanding of how to run the League Manager. 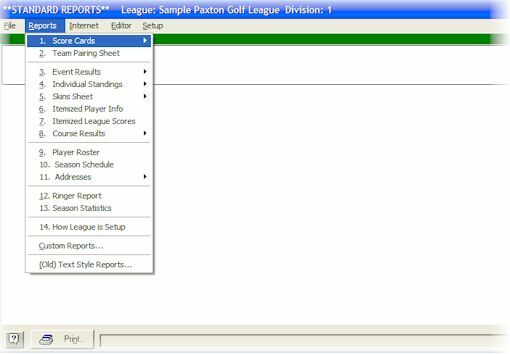 When you first run the League Manager, the Paxton League should be automatically loaded and you should see the following screen. Note: If you have created your own league, you may need to load the Paxton League. To do this, click the League menu and select "Open Existing League". On the League form double click the Paxton League to load it. F - The flight the player is in. Flights can be used as a selection parameter (filter) in individual player reports. For example the Paxton League has 4 flights (A,B,C,D) with individual player standings for each flight. S - Skins. If a player has an "S" beside his name he is included in the skins report. Hcp - Player's handicap for this event. AGS - Adjusted Gross Score (The Gross score adjusted for use in handicapping). Score- The score the player shot for this event. Points - Points that a player received for current event. P - Pars for this event. B - Birdies for this event. E - Eagles for this event. Putts - Putts for this event. Total Points - Total points for the team and players. Versus Team - Opposing team number. Various command buttons are available to change the current event, add substitutes, display scorecards, edit player, etc. The buttons change appropriately depending upon whether a team or player is highlighted and the status of the player. 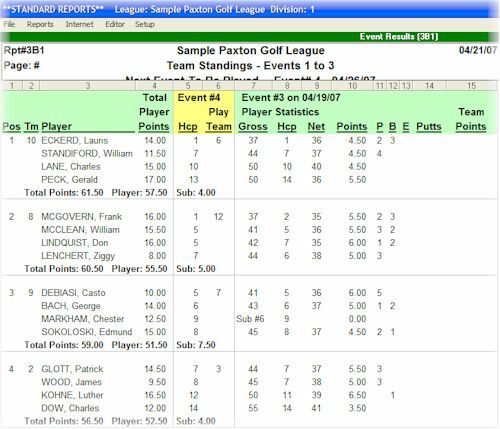 The Paxton League is a four man team league which plays a "player versus player / team versus team" format. It has 1 "baseball" style division (no inter divisional play) with four flights. The league awards one point per hole for player vs player. Handicaps are based on 90% of the best 5 of 8 scores. Note:This league is only a sample of one kind of league the software can run. The League Manager can run almost any kind of league...anywhere from an individual league to team leagues with up to 12 players per team. The Paxton league is a league that plays with opposing teams\players, however LM can also handle NON-opposing leagues. These leagues usually play against the course, against the field, best net score, etc... You can also have up to 6 divisions (Baseball or Football style) with up to 6 flights in each division. Handicapping and Points parameters can also be set any number of ways. Click your mouse on Tom Wisenbaugh. He is on team 1. Tip: A quick way to move to a player is to start typing his\her last name. Type "WI" and you will have Tom Wisenbaugh selected. Click the Substitution button on the bottom of the screen. The substitute list will appear. Double click on Donald Cobb (Sub#9) in the "Select Substitute Player" list. Notice how Tom Wisenbaugh's name has been changed to "WISENBAUGH, To<> SUB#09 COBB, Donald". This lets you quickly know that Donald Cobb is subbing for Tom Wisenbaugh. Note also the Substitution button now reads REMOVE SUB when Tom Wisenbaugh is highlighted. This is the button you would click if for some reason you wanted to remove the substitute. There is only one more scorecard to type in. The fastest way to enter scorecards is to use the numeric pad. Make sure your NUMLOCK is on and get ready to type. Highlight either Paul Shade or Tom Wisenbaugh. Click your mouse on the player, type last name, or use arrow keys to select. Press the '+' key to pull up the scorecard or right double-click your mouse on the player. Type in the following scores for each golfer. Press the "+" key to close the card. 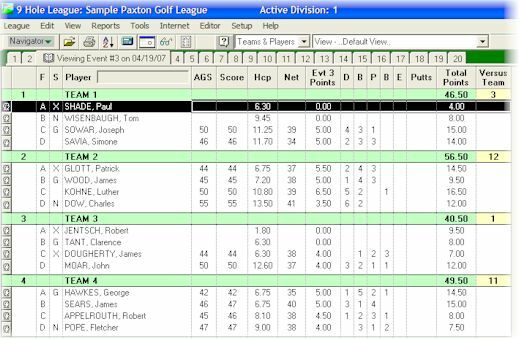 League Manager automatically calculates gross score, net score, adjusted gross score (used for handicaps), points, pars, birdies, and eagles. It also builds a large range of reports, including skins, ringer reports, and course results. Note: You do not have to enter scores hole by hole, you can enter totals only. If you do decide to enter totals only, it is up to you to calculate gross scores, adjusted gross scores, points, pars, birdies, eagles, what ever you need to track. I HIGHLY RECOMMEND entering scorecards hole by hole! It's much faster than entering total scores...and you'll be surprised at the number of scorecards it catches that are incorrectly calculated. Also, any reports that rely on hole information will be disabled (skins report, ringer reports, course report, etc.) Plus, YOU end up doing all the work, not the computer! Click your mouse on the REPORTS button, or select �Standard Reports� on the Reports menu. The reports form appears. The reports form lets you view and edit your reports before printing them to the printer or a disk file. The first line on the screen displays the menus...File (print and save reports), Reports (list of reports you can print), Internet, Editor (edit reports) and Setup (Page setup for your reports). The box under this lets you view\edit the current report before printing. The bottom line displays the Print button, which lets you send the report to the printer or save as a file to disk. Click your mouse on the Report menu and select "3. Event Results". Then select "3B. Team Leagues". The Event Results (3B1) form will appear. This form allows you to customize what items appear on the report. After you've set all options click on [OK] to print the report. The report will appear on the screen. To scroll the report up or down click the mouse on the scroll bar on the right side of the screen. If you want to print this report to your printer click on the Print button. You want to print the skins results for this league. Click your mouse on the Report menu and select "5. Skins Sheet". Then select "5A. Individual Skins"
The "Individual Skins" form appears. This form gives you many options to customize your skins sheet. The defaults should be OK. Click on OK to print the scorecards. The report appears on the screen. After you have viewed this report, pull down the Report menu and print some other reports. Feel free to experiment. After you are finished viewing\printing reports, click on Close (bottom right corner of screen) or press ESC to exit the reports form. You will be back to the main League Manager screen. Click the number 4 tab on the tab bar that shows events 1 to 20. The tab bar is above the team/player list and below the menu options. Click "OK" to confirm that you are ready to move to event #4 (the next event). Note: You can always move back to a past event at any time. League Manager will calculate points, handicaps, and pairings for Event #4. Now the Paxton League is ready to play another round of golf. As you can see, after you set up your league, the basic process of running a league is to post cards and print results. The League Manager does all the calculations for you. League Manager also makes it easy to do "what if" scenarios. Move back to event 1 and change how handicaps and points are calculated for the league. As you proceed through each event, new points and handicaps will be calculated using the scorecards already entered. Click the number 1 tab on the tab bar to move back to event #1. Click "YES" to confirm that you are ready to move to the past event. When you have moved to event one, pull down the Setup menu and change "Handicap Calculation Parameters" and/or "Point Calculation Parameters". See the manual for more information. Click your mouse on the League menu and select "Exit League Manager". The speed key is CTRL+E.